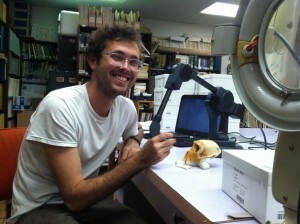 Evan is a Ph.D. student in biological anthropology. His research interests include: cercopithecoid evolution, ontogeny and phylogeny, heterochrony, geometric morphometrics, and primate cranial evolution. Using the tools of geometric morphometrics, Evan is interested in investigating patterns of cranial growth and development in many Old World monkey taxa to determine if cranial shape evolution is related to changes in the relative rate and timing of developmental stages.